As promised, Mikatan has just posted a preview of Nendoroid Sayaka Miki, the 4th Puella Magi to join the Nendoroid army. She will bring 3 face plates – smiling, upset, and pained expression – as well as 8 swords (Unlimited Blade Works? XD) with their own respective little stands and some optional body parts to re-create various scene from Puella Magi Madoka Magica. 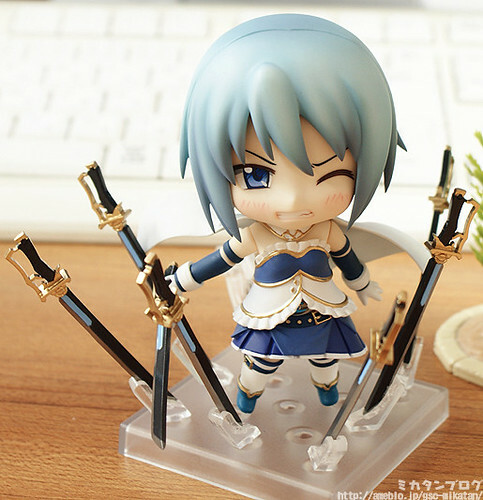 This entry was posted in News and tagged nendoroid, puella magi madoka magica, sayaka miki. Nice! I like her expressions and all her swords. Will be getting this one for sure.